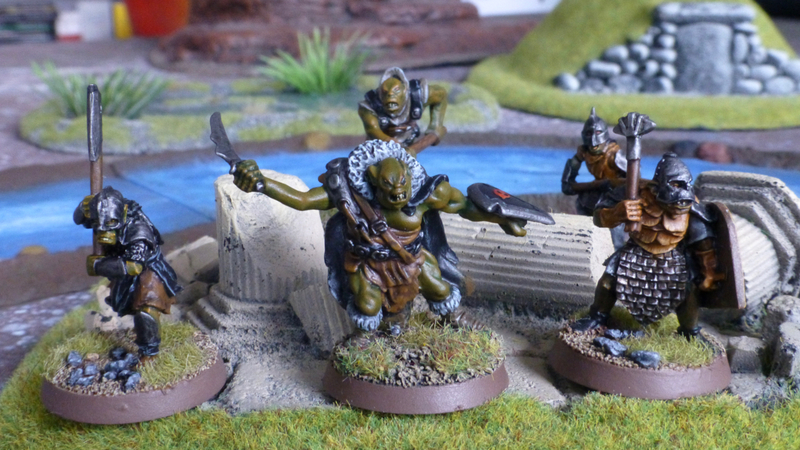 Not least inspired by Azazel’s forces of Mordor, I had a rummage through my stash of dormant projects to find the Mordor Orcs which I painted when The Fellowship of the Ring was released. Some work on the bases later, and they are now an active faction in my roster of armies. 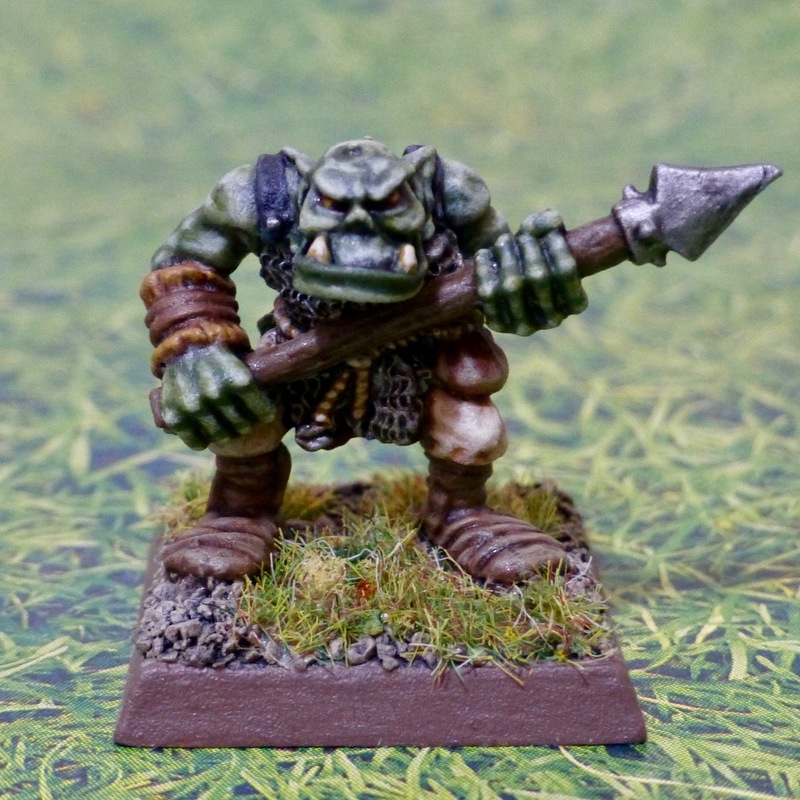 The party is lead by the Great Goblin from Mithril Miniatures which stems from my even more remote days of playing MERP. 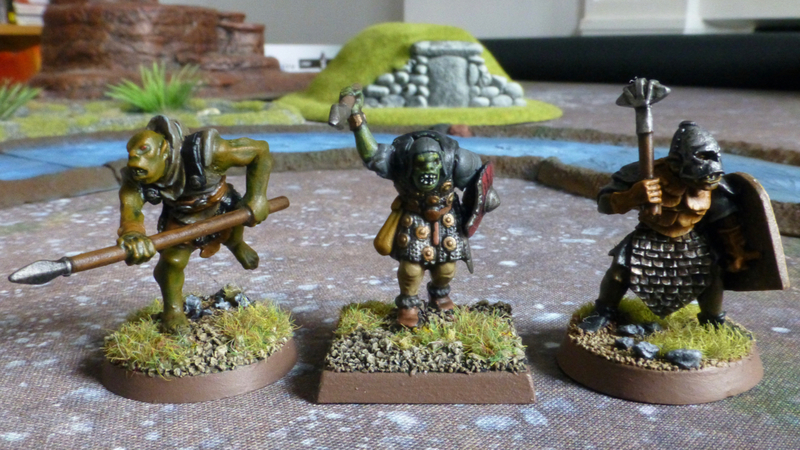 There’s been a lot of talk in wargaming circles about using the Oathmark goblins as orcs for Lord of the Rings, so I thought I’d take a comparison picture between the three ranges I own. 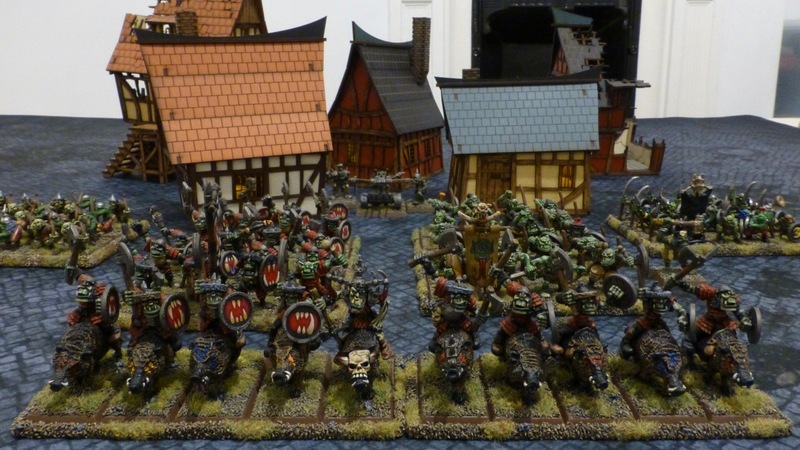 The horde of Orcs & Goblins I am gathering for Warhammer 3rd Edition has got paint on in its entirety (I’m aiming for a modest 1,500 points under the Warhammer Armies list), but about half still needs to be shaded, highlighted and detailed. 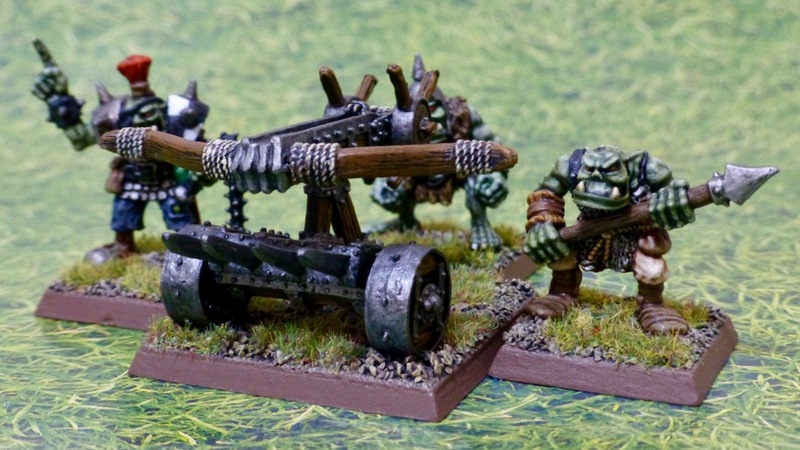 Buoyed by the thrill of finally seeing the boar riders finished, I took aim at my second artillery piece. 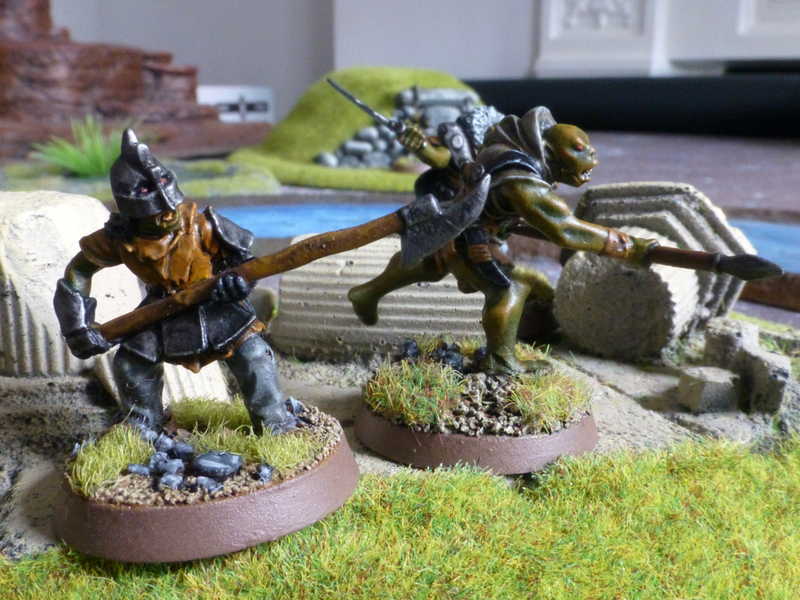 The Orc Spear Chukka had been in painting limbo the longest by far. 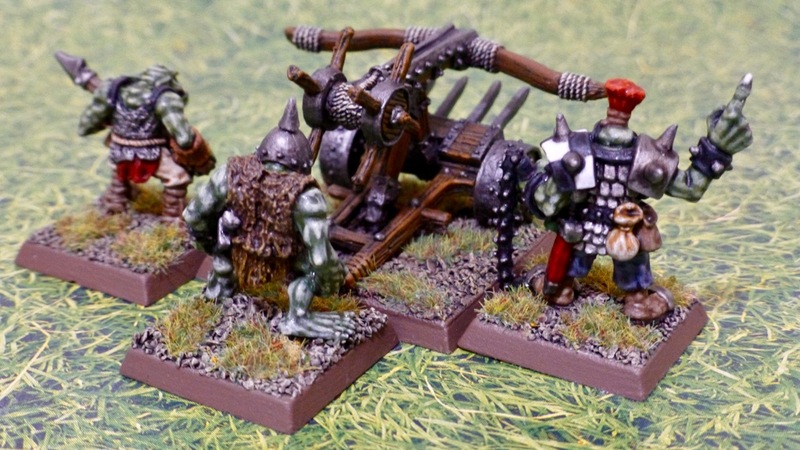 The bolt thrower itself has been in my possession for decades and it has seen service with a variety of armies. 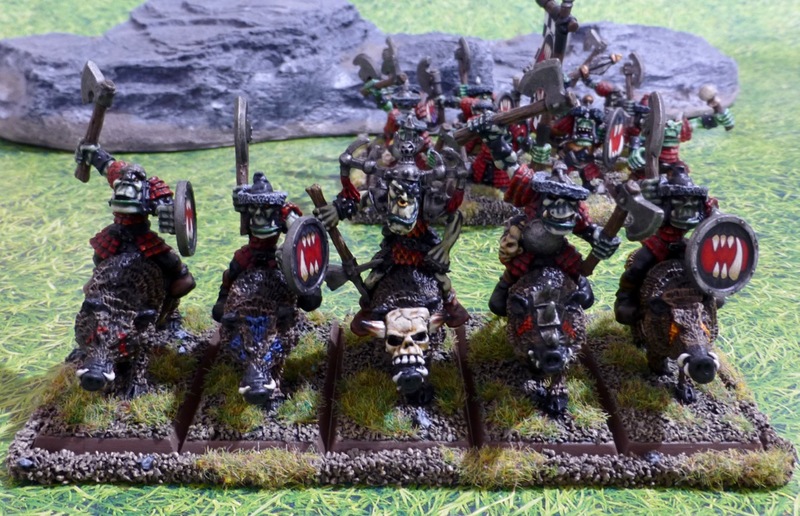 Eventually I acquired some of the Orc crew to go with it, so it is now a fixed part of their artillery. The commander originally belongs to the Rock Chukka of the same series. 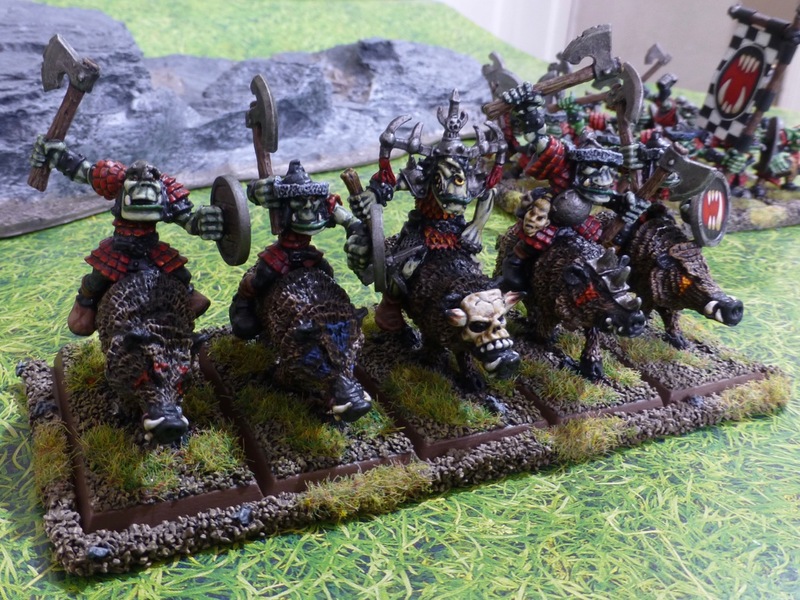 Back in Orctober I continued work on a mob of war boar riders for my Warhammer 3rd Edition Orcs & Goblins. 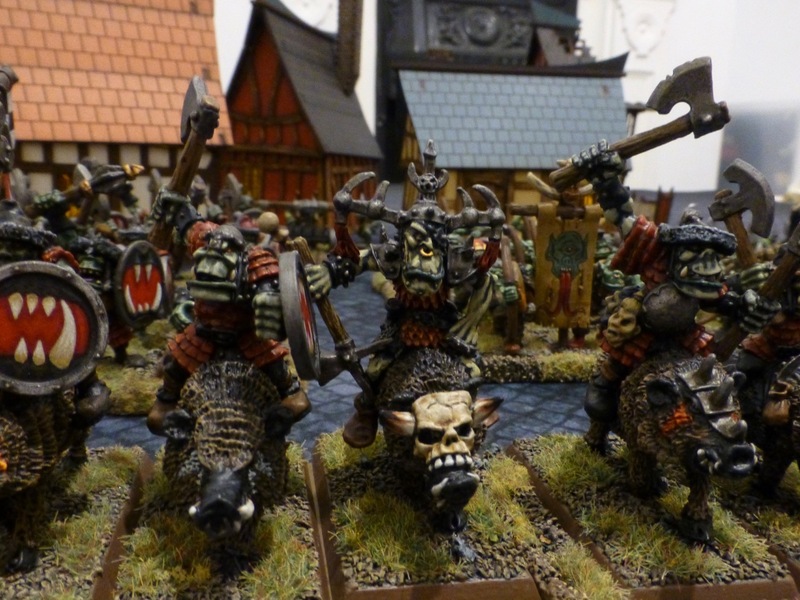 I converted these three years ago already, using the Marauder MB2 infantry models as riders on Citadel war boars. 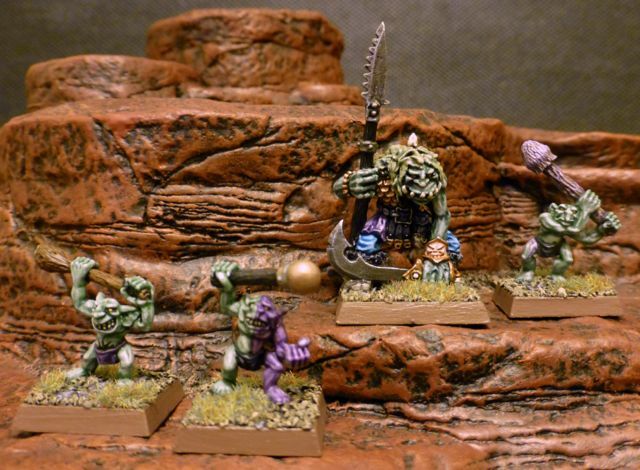 Now the second rank of five is finished, also completing the continent of the Greedy Maw tribe for my Oldhammer army. Heavily armoured and well equipped with a regiment on foot and the only cavalry in the horde, these are the elite core of the force who have subjugated other tribes and lead them into battle. 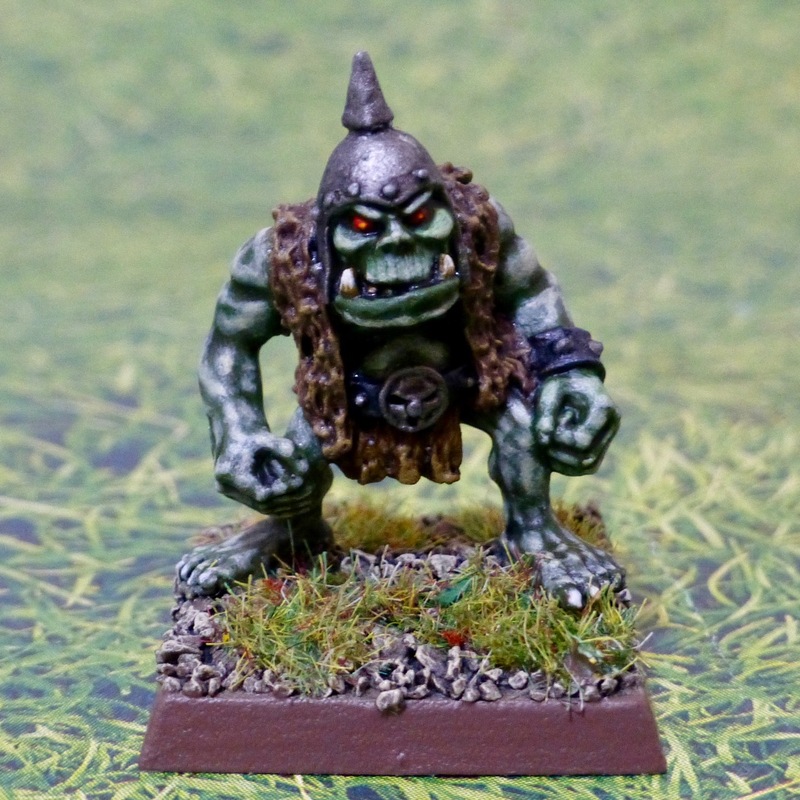 It’s been three years since I converted and painted the first Orcs Snorta for my Oldhammer Orcs & Goblins. 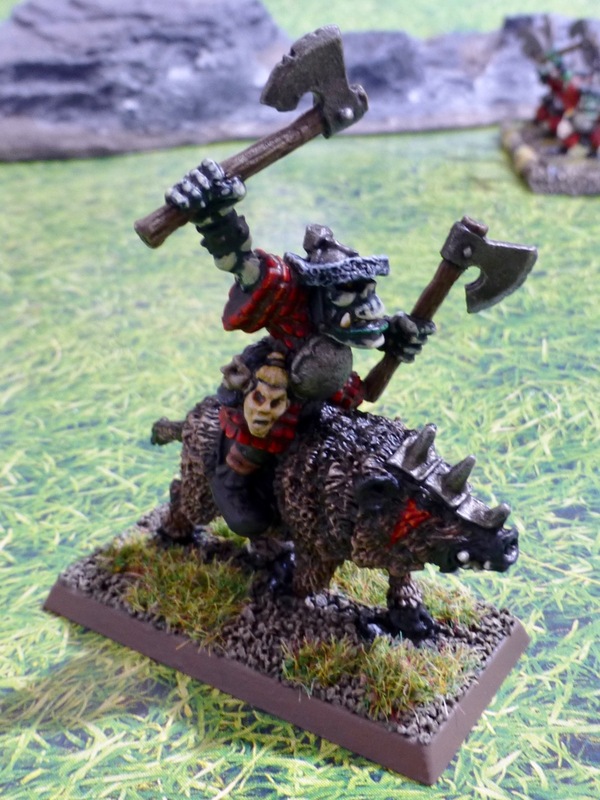 Now that Orctober has come around once again, it was high time to turn this lone rider into a unit. 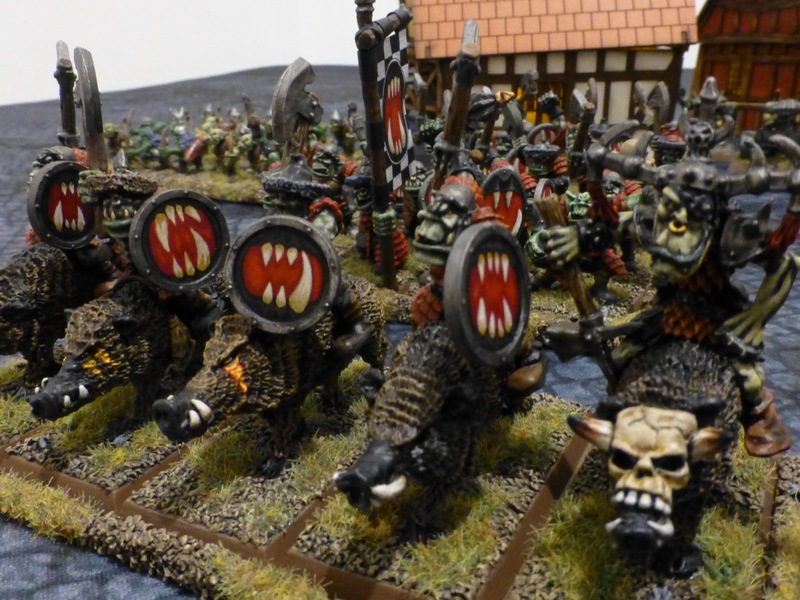 The war boars are all Citadel and designed by Goblinmaster Kev Adams. As the hero of the mob I chose a rider by Kev with a suitably impressive helmet. 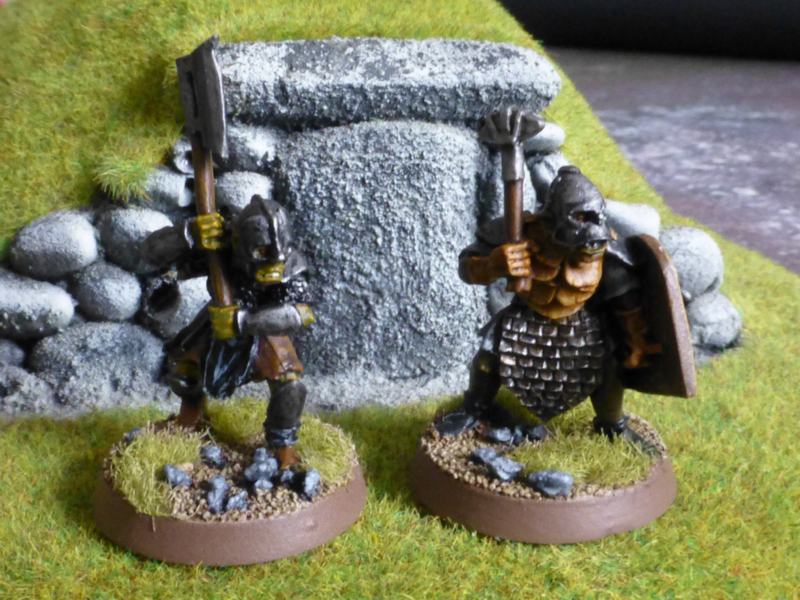 The champion and troopers are from th MB2 Marauder range on Citadel boars. 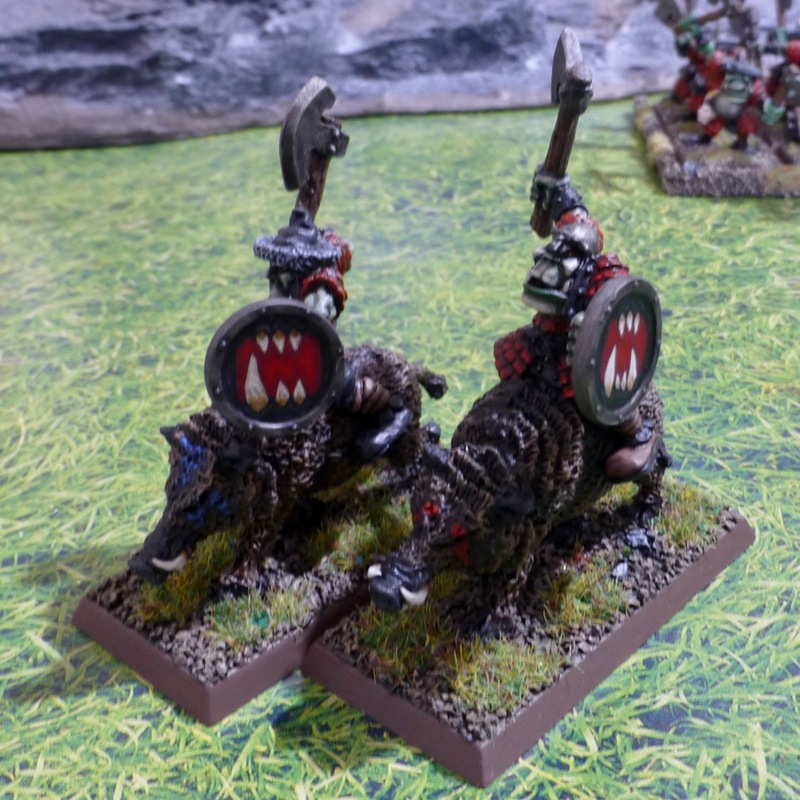 It was an easy conversion job, snipping off the legs under the scale mail and reattaching them against the flanks of the mounts. I have five more riders sitting ready for painting as a second rank to complete the elite contingent of the army. 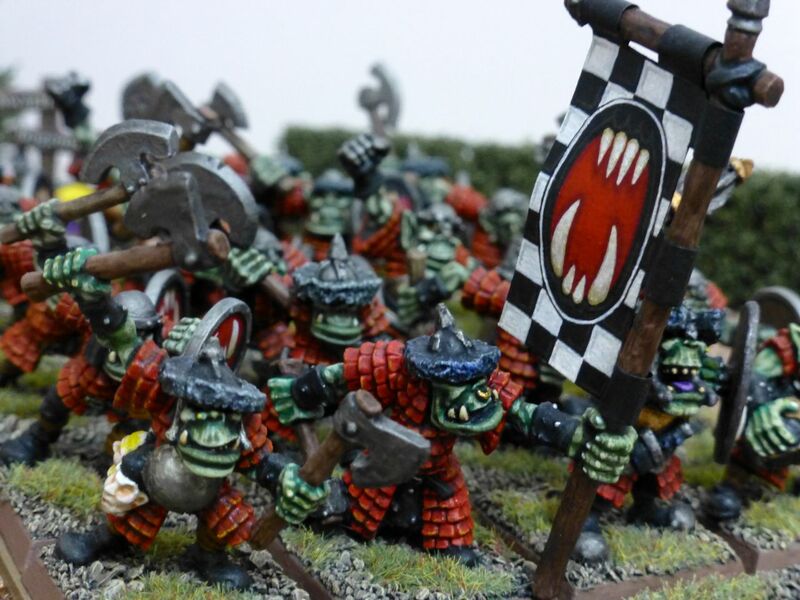 After that, more of the boyz and scores of gobbos! The chances of getting an Orc Champion in Slaves to Darkness aren’t very high – roll 96-00 on a D100, followed by 69-80. However, when reading how Chico, that prophet of perversion, was raising a coven of Slaanesh worshipping Dark Elves, against all odds a seed of corruption was planted in my mind. Those are the dangers of following Oldhammer on a Budget. 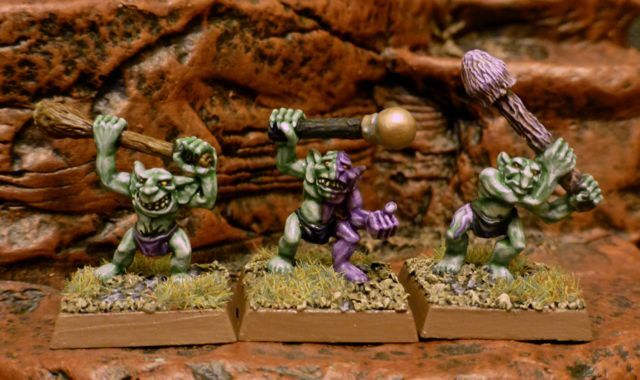 Several models from my unpainted greenskin collection immediately sprang to mind as suitable followers for the Prince of Pleasure. First off, some impressionable and simple minded, yet easily excitable Snotlings. Always prone to playing cruel games and pranks, they should serve to give Slaanesh a giggle or two in their desire to please him. For the Champion itself, my eye fell on the model for Hardnose Mard the Truly Unpleasant. 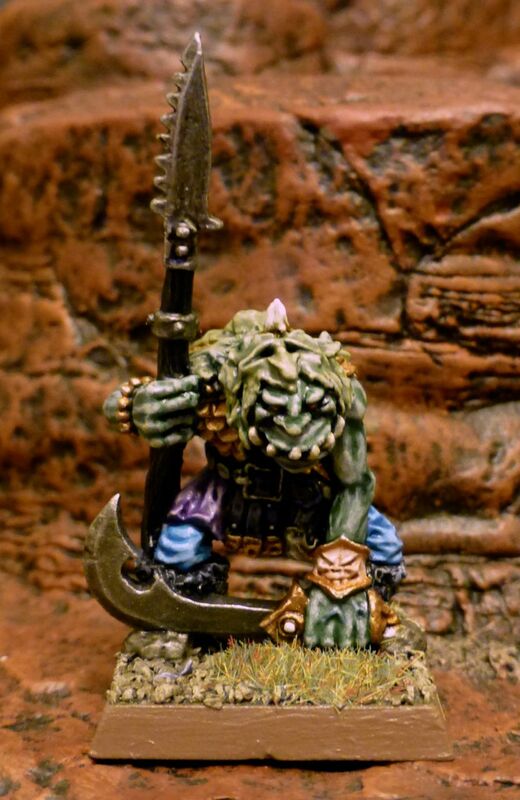 This character was featured in the Ravening Hordes flyer from the Warhammer 2nd Edition box set. 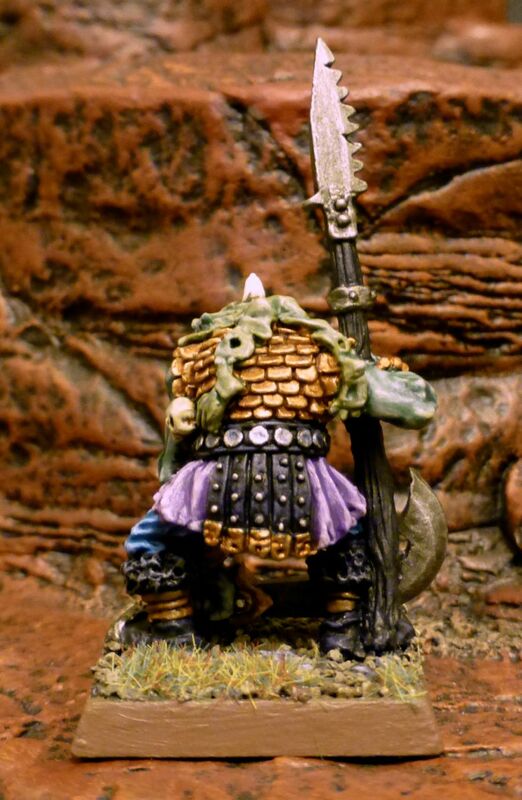 I’ve been looking for a suitable role for the figure since it’s a great sculpt with lots of character and extravagant detail, but doesn’t quite fit with the rest of my Orcs & Goblins for Warhammer 3rd Edition. I painted the newly coined Champion of Chaos in polished bronze, lush pink and blue and shiny silver, to please his patron. 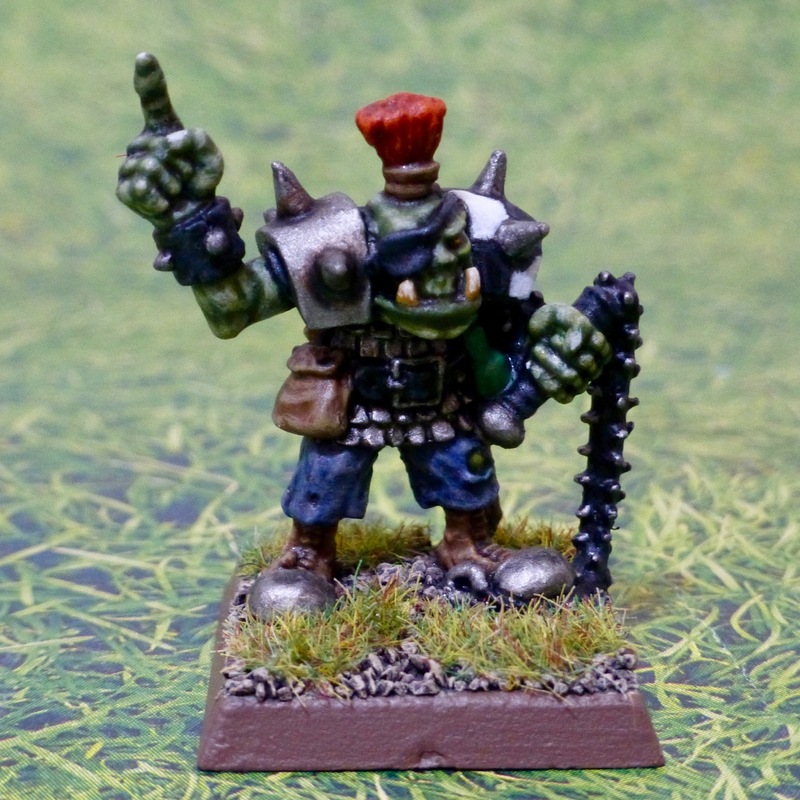 The flayed Snotling hide was painted in old Gretchin Green. I have yet to discover the backstory of how this Orc came into the service of the Lord of Decadence. I think it has something to do with prolonged exposure to Dark Elves and a demonic bracelet. 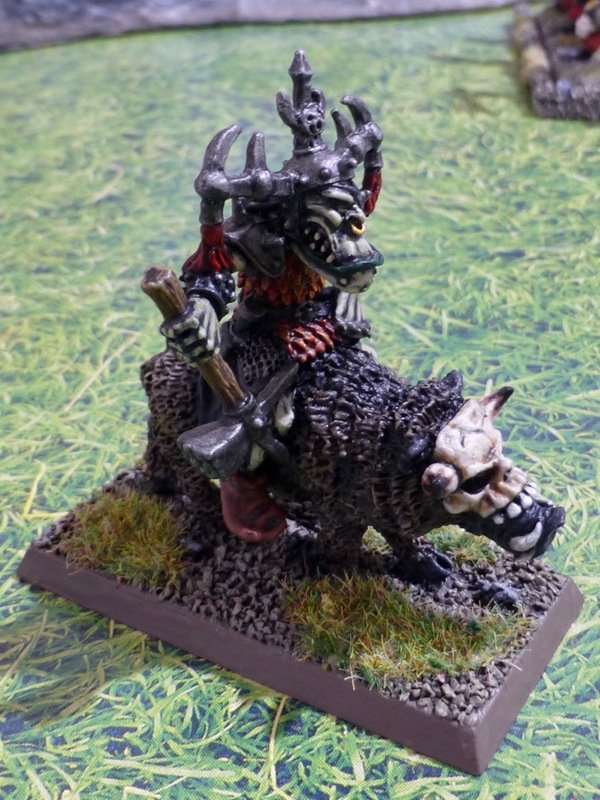 As for future followers of this Champion – not many self-respecting Orcs or even Goblins are going to follow his path so he will most likely ally himself with foul Beastmen and the human slaves to darkness. 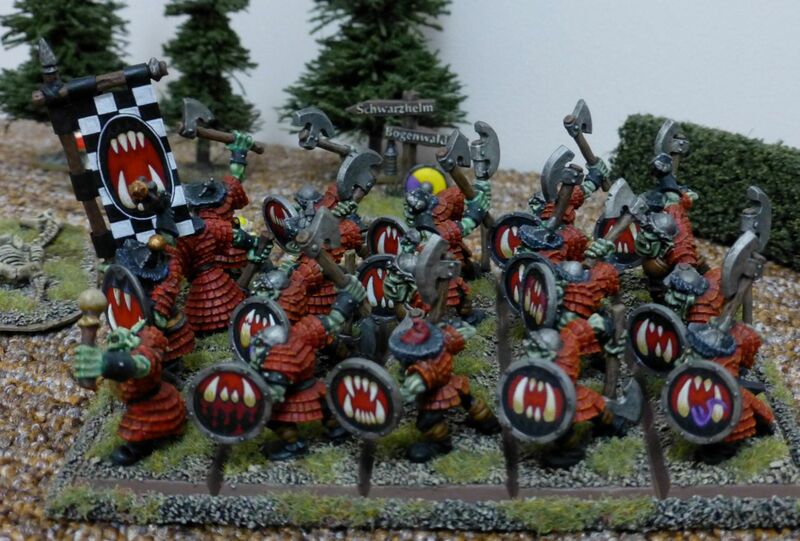 The regiment of Big Uns for my Warhammer 3rd Edition Orcs & Goblins is finished. Halfway through a unit of this size I usually run out of steam, but this time I kept steadily at it, while working on some side projects for variety. I converted the banner pole since it is too large in its original configuration and sticks out way in front of the model. 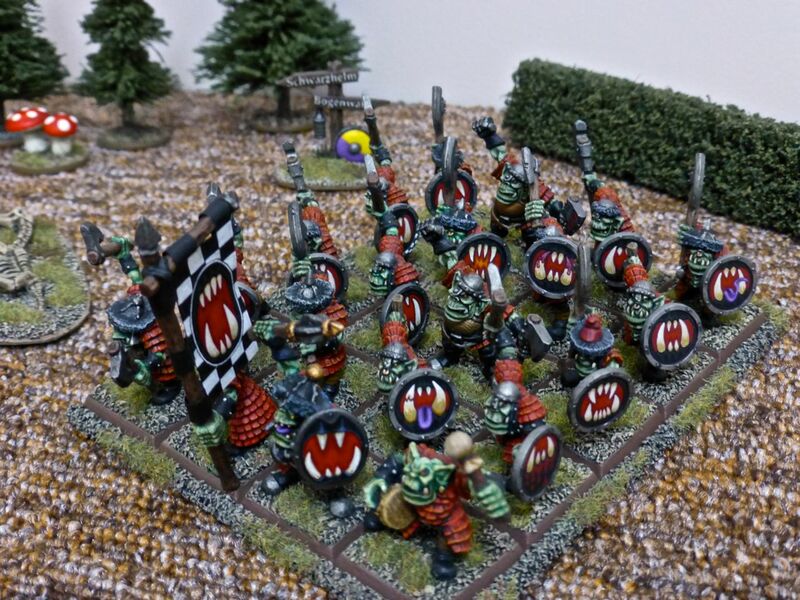 With the overall theme of the unit being “sumwer’ from tha east”, I felt a Nippon style banner wouldn’t look out of place. The shield emblems are all variations on the tribe’s motif, the Greedy Maw.